Old architecture, old Spaniards, old battles, blah, blah, blah -- who cares, take me to Disney! Most visitors to Florida b-line it straight to the mouse trap and who could blame them! The glare from central Florida is so blinding you can hardly see the rest of the state. After all, Florida is just a state, Disney is a WORLD! Don't get me wrong, I like going to Disney. I like theme parks in general, Disney, Universal, Bush Gardens, etc., and I've probably been to Disney over 50 times (I'm in therapy for this addiction). I just love seeing the delight on children's faces and I really love rides, especially roller coasters, BUT there is so much more to Florida. Now, I confess, I'm not very good at history. I've forgotten most of what I learned. Fortunately though, my husband is a walking encyclopedia. I'll admit that I sometimes resent the smarty pants, but I'm mostly in awe of him. Although, I sometimes glaze over when he's talking about another battle scene (like I did in Mr. Stoviaks 10th grade class), I mostly find it very interesting and better still our 11 year old daughter can't get enough. Oh, make no mistake, mom is awesome for a Rockin' Roller Coaster ride, but dad is pretty awesome without going upside down! My point is, with all the talking, flashing, whirling "techno" stuff that's coming at our children these days it is still possible to slow them down and let them experience the real and the genuine. St. Augustine is a charming walking city complete with trolley tours, carriage rides, ghostly tours (including a pub hearse ride) and nearby beautiful beaches. Oh, it's a tourist town for sure, but it is also the real deal. 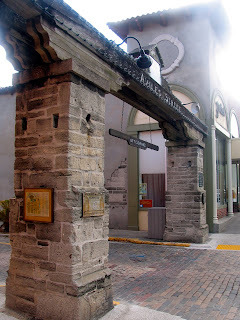 If the ghosts were visible you might encounter Ponce de Leon (explorer and treasure seeker) or Henry Flagler (industrialist, oil magnate and railroad pioneer), and yes, you can drink from The Fountain of Youth. How many towns can boast that kind of pedigree? St. Augustine was founded forty-two years before the English colony at Jamestown, Virginia, and fifty-five years before the Pilgrims landed on Plymouth Rock in Massachusetts - making it the oldest permanent European settlement on the North American continent. That's impressive! Let me see if I can get this right, Spain (Ponce de Leon) discovered it (1513), claimed it and named it La Florida, though, the French succeeded in establishing the first colony (1564). (Also noteworthy is that Ponce de Leon also discovered a strong northerly current that would allow ships to return home quickly; now known as the Gulf Stream). Spain (Adm. Menendez) retook La Florida shortly after the Feast day of St. Augustine (1565), thus the name, and with the help of a hurricane also defeated the French fleet. England (Sir Francis Drake) attacked and burned it (1586) and pirates (Capt. John Davis) plundered it (1668). Spain (1672-1695) finally built a stone fort (Castillo De San Marcos, now Fort Marion) and to this day it has never been taken. In 1763 Spain ceded Florida to England (Treaty of Paris) to regain the capital of Cuba. The British ruled for 20 years then returned Florida to Spain (1783) 2 years after and resulting from Spain taking West Florida and Lord Cornwallis surrendering to George Washington in Virginia. 37 years later Spain sold Florida to the US (1821) and Spain relinquised control of East Florida in the Government House (Museum) in St. Augustine. St. Augustine survived a yellow fever epidemic (1821), The Seminole Indian War (1836) and The Civil War (1861-1865). In 1845 Florida became the 27th state. When the Civil War ended in 1865 the town was 3 centuries old. Wow, this place makes the Pirates of the Carribean look like a kiddy ride (pun intended)! It's a good thing these ghosts aren't really present I don't think they'd get along. In 1845 Henry Flagler rolled in and became the golden boy of St. Augustine. With his vast fortune he built his dream town. He was responsible for the building and development of the town's hospital, city hall, several churches, the train depot and the Florida East Coast Railway. He also built two lavish hotels, the beautiful Alcazar (now the Lightner Museum) and his masterpiece the Ponce de Leon (now Flagler College). In 1887 and 1914, fires wiped out many historic buildings, however, beginning in 1959, and continuing today, the state has an ongoing preservation effort, meticulously restoring many colonial structures to their original appearance. Wow! That was a little like going through the Louvre with the Griswolds! 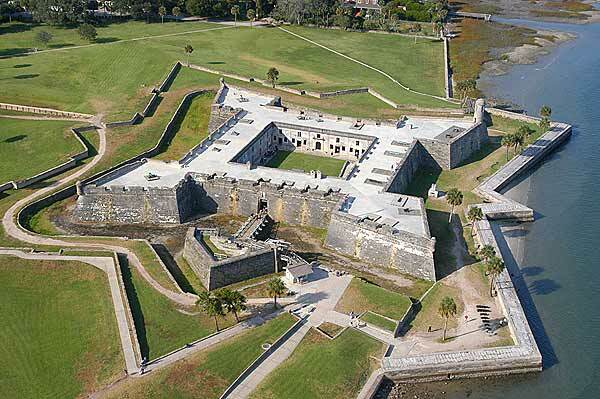 St. Augustine withstood exploration and settlement, plunder, plagues, fires and hurricanes. It has been affected by, fought over and traded through almost every conceivable war among nations having anything to do with North America since it was discovered. It is a city of commerce and trade, poverty and wealth, perseverance and new beginnings and its players belong to a virtual list of who's who among historic characters. Yes, St. Augustine is a city with a rich history but the Kings of Spain, France and England, nor pirates, ever took its treasure because these treasures can't be taken. From its first know human inhabitants the Timucua Indians through its European settlements to its sun drenched shorelines this is a place filled with riches to discover. So, visit all of Florida, even the mouse trap, but bring your little conquistadors to St. Augustine because it's a real treasure! The Casa Monica Hotel (pictured left and below) is a great place to stay. Built in 1888 it is one of the oldest hotels in the US and is located in the heart of St. Augustine occupying one of four noteworthy corners the other three are occupied by the Government House Museum, Flagler College and the Lightner Museum. Its Moorish Revival architecture is absolutely beautiful.